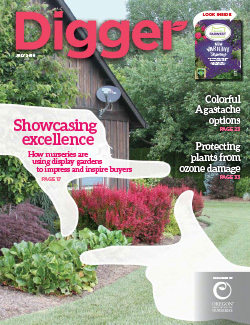 Growers can read about the pros and cons of creating a display garden for buyers to explore on site, or check out the colorful varieties of Agastache which are becoming a perennial favorite in this month’s Digger issue. Plus, the Farwest show is almost here! Explore the Farwest Show New Variety Showcase insert to see the latest plant varieties making a debut this year. Patrick Newton, chairman of the Farwest Committee, introduces himself in the Meet the Leader section. Excellence on display: Is it worth the trouble of creating a display or trial garden at your nursery? We spoke to several growers about the challenges and benefits. A perennial favorite: Traditional and new Agastache varieties offer beauty, fragrance and other endearing qualities. Farwest Show New Varieties Showcase: Preview the new plant varieties coming to the Farwest Show. Meet the Leader: Patrick Newton: The self-described “city kid” embraced the challenges of learning a new industry and rose to become Farwest Show chairman.